Just as a foundation supports a building, so a foundation supports a mattress. 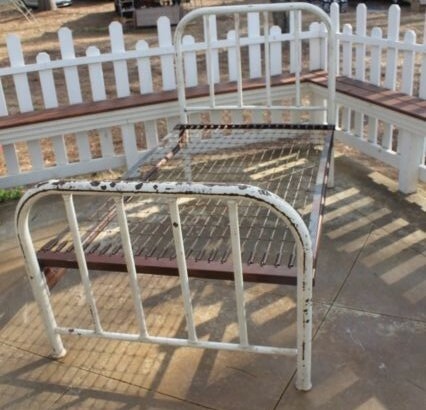 When mattresses were first made, they sat directly on the ground or the floor. Sometimes the mattress was set on a raised area, a platform or ledge, which then became the foundation. This helped keep the bed dry and warm. At some point in time, those who could afford it had beds with legs built to hold the bed off the floor with free space underneath. Raised beds are not new. The Old Testament book of Deuteronomy records that, about 1400 BC, King Og of Bashan had an iron bed. Long before that, before 3000 BC, wealthy Egyptians had beds, the predecessors of modern beds and foundations. Today, we have several kinds of mattress foundations. The bed and the foundation used to be one-and-the-same, but now most foundations rest in or on a bed frame (or bedstead). This began with the introduction of box springs. Since they did not have legs of their own, they rested on a simple frame with legs or casters. Now all kinds of foundations can be fitted on frames, with or without headboard and/or footboard. The platform bed can be considered the “original mattress foundation.” The mattress was little more than cushioning for the hard surface. 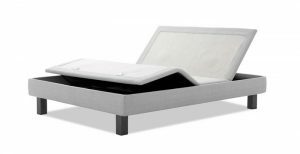 After the introduction of memory foam beds in 1991 (1992 in the U.S.), manufacturers realized that foam mattresses needed consistent support. They introduced platform foundations, which could be placed on the same frame used for a box spring. 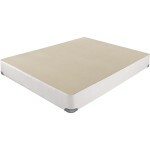 Introduced for foam mattresses, the platform foundation was perfect for airbeds. Now it is also used with some innerspring models. At first, the standard height of a platform foundation was the same as a box spring, 8 or 9 inches. As mattresses became higher with the addition of more foam comfort layers, they became harder to get into, so the low profile foundation of 4 or 5 inches was introduced. Now some manufacturers have a 2” ultra low platform foundation for ultra high mattresses. 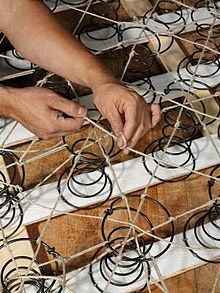 The first bedsprings were wire grids fastened to the bed frame by tight coil springs. 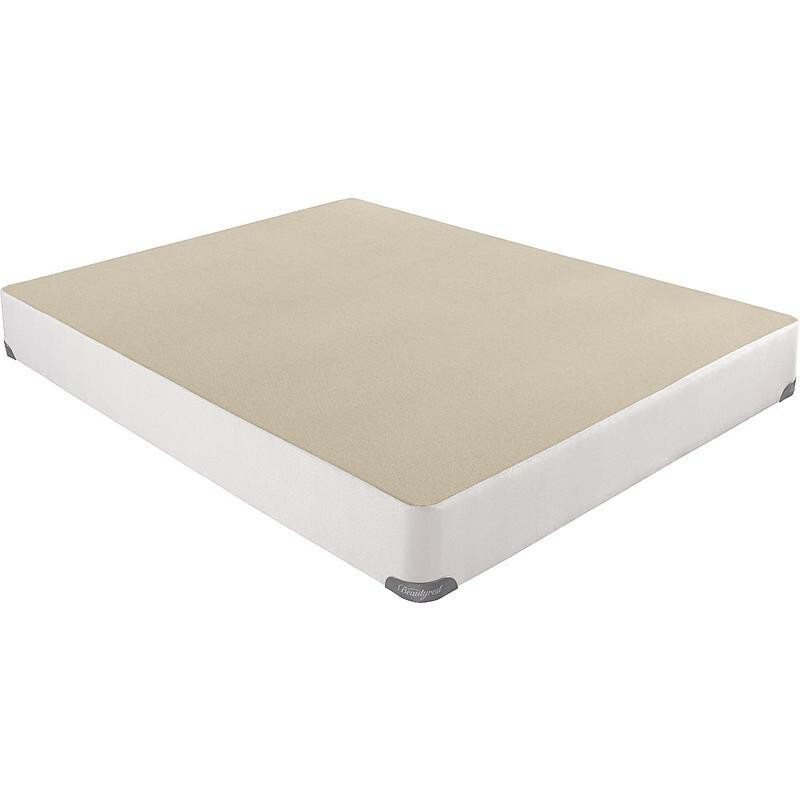 Used for thin cotton batting mattresses, they provided resiliency and were not as uncomfortably hard as a solid platform. After the introduction of the innerspring mattress, the box spring was invented. It is springs in a wood frame (box) covered with fabric. The springs are firm enough to support the mattress and sleepers, yet resilient enough to absorb shock. This makes the mattress last longer. The springs themselves are not necessarily coils. They can be an array of extra-heavy gauge S-shaped or corrugated spring wire. Preferred in Europe, these foundations have several closely spaced slats made from a springy wood, such as beech. Like the box spring, a wood slat foundation absorbs shock. Unlike the box spring, it does not depend on metal, making it preferred by persons wary of the amplification of electromagnetic radiation (radio waves). Wood slat foundations are now being made and sold by mattress manufacturers in the United States, such as European Sleep Works (ESW). The “Flexible Slat System” made by ESW is adjustable so the users can make it customize the response. With a slat foundation, if slats are spaced closely enough, they can be used for memory foam mattresses. They began as hospital beds. Healthcare is still the major market for Invacare and a significant one for others, such as Med-Lift and Flex-a-Bed, but adjustable foundations are now consumer items. They are promoted not only for health, but for comfort and convenience. Modern models include massage functions, have electrical outlets and USB ports for appliances and electronic devices., and are Bluetooth enabled. Most adjustable bases can now fit within existing bed frames. Appearance isn’t everything, but it does count. 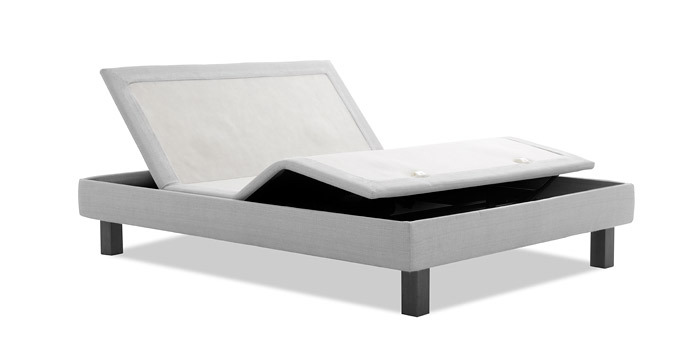 Most foundations sold by a mattress manufacturer are upholstered to match the mattress. Many mattress sets (mattress plus foundation) are designed to be compatible with almost any room décor or theme. Some manufacturers who make the mattresses and foundations to order will let you choose the color(s). When buying a mattress, don’t forget the foundation. What types of foundations does the mattress you are considering need? Does the warranty specify certain foundations? How much do these foundations cost? Does the foundation you have meet the requirements? The right base will extend the life of your mattress, help you sleep better, and benefit your spine. This entry was posted on Friday, June 6th, 2014 at 9:46 PM and is filed under adjustable beds, beds, coils, foundations, furniture, springs . You can follow any responses to this entry through the RSS 2.0 feed. You can leave a response, or trackback from your own site.